Using task killers  on Android is a controversial topic. Many people are for task killers while many are against. 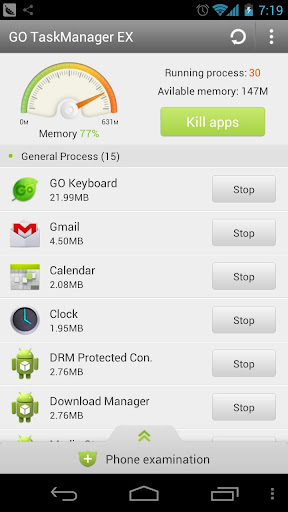 My personal view on task killers is explained in dotTech’s article on Best Free Task Killer  for Android. In any case, if you are one of those convinced task killers help improve smartphone performance, Go TaskManager EX is another task killer for you to look at. Go TaskManager EX is a bit different than other task killers. The first noticeable way it is different is it separates tasks/processes into three groups: ‘General Process’, ‘Permanent Process’, and ‘System Process’. This categorization of processes helps you better understand which processes are likely to automatically restart themselves, e.g. processes listed under the latter two categories are likely to automatically restart themselves and thus there is no point in killing them. The other difference is Go TaskManager EX has more than just task killing capabilities; it has the ability to clean app cache, scan and tell you which apps automatically start at boot, inform you of ‘High risk apps’ (it isn’t exactly clear how apps are determined to be high risk), and scan and find APK files on your device. Other features of Go TaskManager EX include a whitelist which tells Go TaskManager EX to never kill apps listed in the whitelist; automatic app killing capability which automatically kill apps as defined in the blacklist; a notification in the notification bar that tells you how much memory is currently free; and 1×1 and 4×1 widgets for easy task management from your homescreen. 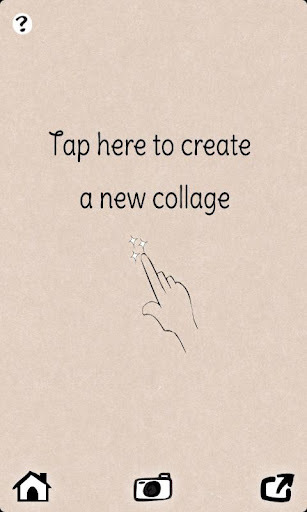 Want to create collages on your Android device? Pic Collage can do just that. Pic Collage maker is an app that allows users to create collages out of their… pictures. You can use existing photos from your gallery or Facebook; or you can snap new photos with your camera; or you can pull images from the Internet. Pic Collage has no ‘template(s)’; it allows you to create free hand collages. In other words, once you have added images to a collage you can freely move the images around, rotate them, resize them, place them on top of one another, etc. — there is no set shape or template you must fit your photos to. Other things you can do to images once you add them is make basic edits such as adjust sharpness, brightness, contrast, saturation; add effects; fix red eye; draw on images; add text to images; and adjust white balance. Aside from adding images to a collage, you can change the collage background. Once you are ready to export your collage, you can either export it to Facebook, Twitter, Gmail, or other apps that accept image inputs; or simply save the collage on your device. Collages are saved PNG images. The resolution of the collage images isn’t exactly clear. There is an option in Pic Collage’s settings which allows you to control the ‘Resolution’ of collages (from as low as 320 pixels to as high as 999 pixels) but the setting makes no sense — a resolution contains a width and height, not just one. In any case, the collages are saved as 480×800 on my Android device, which is my device’s default screen resolution size. Take note Pic Collage isn’t 100% bug free. I ran into a bug where it refused to load images into collages saying something like cannot save null. It wouldn’t work even after I force closed Pic Collage. I had to restart my device before Pic Collage started working again. So be aware of this when you use Pic Collage. For the most part, however, it works just fine. SWF Flash files are a conundrum in the computing world; because of how they are designed, video players often don’t play SWF format files. Indeed many of the video player apps  on Android can’t play SWF files. This is where Open Flash comes in. Using Open Flash is very easy. Simply store the SWF file you want to play on your device, run Open Flash, navigate to the file, and play it. Since Android doesn’t support playing of SWF content, you will need to specifically navigate to SWF files with Open Flash to play them rather then try to use your default file manager . Open Flash is the free and ad-supported version of the app. Open Flash Pro is the paid and ad-free version of the app.